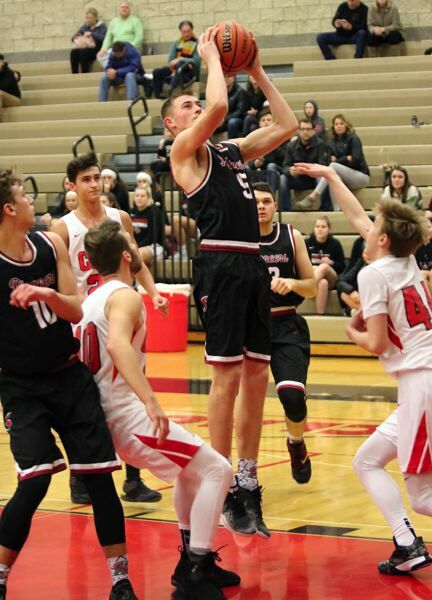 CLACKAMAS — Sandy High School's boys' basketball team found itself in a hole that was a little too deep to climb out of Friday night. How did the Pioneers get there? Some of it was their own doing, but a lot of it had to do with the Clackamas Cavaliers playing one of their best games of the season at both ends of the court. Clackamas' Jailen Hammer scored 14 of his game-high 22 points in the second half and the Cavaliers rode their pesky defense and some timely outside shooting to an impressive 77-63 home win over the turnover-prone Pioneers in Friday's Mount Hood Conference opener. Sandy was held to only two points in the first quarter and chased from behind the rest of the way. 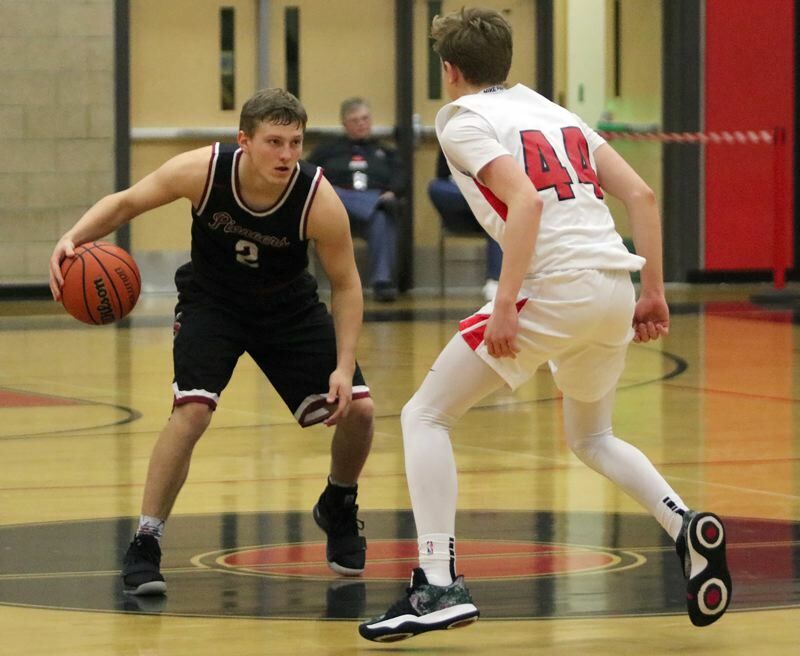 "The biggest thing, though, was that when Sandy made some little runs, previously we may have folded, but tonight we stepped up and got big stops and we hit big shots," Clackamas coach Cameron Mitchell said. Clackamas didn't exactly light it up to start the game. In 15 first-quarter possessions, the Cavaliers went 5 for 16 from the field and 1 for 4 from the free-throw line with no turnovers, which wasn't great, but it was good enough to keep them three steps ahead of Sandy. The Pioneers had a nightmarish first quarter, going 1 for 8 from the field with no free throws and 10 turnovers in 16 possessions. After Hammer stole the ball for Clackamas and fed Daniel Mahler for a lay-up that gave the Cavaliers a 9-0 lead, Sandy coach Jason Maki called timeout with 3:48 to play in the first quarter and pleaded with his team to "Wake up!" The Pioneers then came out of the timeout and threw the ball away again. "It didn't feel like us out there," Maki said. "We've been a team that's really been pushing the pack, playing with a ton of energy, and flyin' up and down the court. We looked like we were in mud tonight." Clackamas extended to a 30-10 lead midway through the second quarter when Hammer came up with the ball off a Sandy turnover, got fouled on the way to the basket, and made both free throws. "Honestly, I think a lot of it was our first league game at home, we had a pretty good crowd, and we all just played together and it was fun," Hammer said. Sandy used a 13-4 run to cut Clackamas' lead to 34-23 at halftime, creeping close enough to get the Cavaliers' attention. Each time Sandy threatened in the second half, Clackamas responded with one big shot after another. When Sandy's Colby Carson made two free throws to pull the Pioneers within 35-28 with 6:42 to play in the third quarter, Hammer drilled a 3-pointer from the top of the arc to make it 38-38. When Tanner Brewster completed a three-point play for the Pioneers that made it 48-42 with 1:38 left in the third, Jack Dorn buried another trey to make 51-42. And when Brewster scored the first basket of the fourth quarter to cut Clackamas' lead to 53-47, the Cavaliers answered with a 16-8 run that featured four consecutive 3-pointers by Damon Erickson, a sophomore who recently started swinging up from the JV team. Erickson's final basket made it 69-55 and all but put the game out of reach with 4:30 to play. "They hit the shots when they needed to," Maki said. "There were a couple times we flew around, they got a long rebound and kicked it to No. 44 (Erickson) and hit a three, and those are just back-breakers because we had worked so hard for 15-20 seconds and then don't get the rebound and they hit a three." Sandy's Kaleb Hubbard came off the bench to score a team-high 20 points and Colton Gorski added 14 points. "We just didn't play our basketball," Gorski said. "This is the worst game we've played all year, but I'm not too worried as far as the league goes. I mean, we're never going to play this bad again." 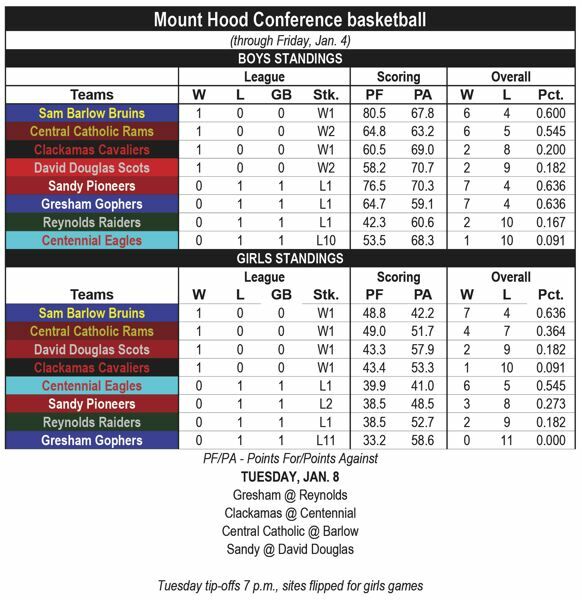 Sandy plays a doubleheader at Reynolds on Friday, starting with the boys game at 6 p.m.
Sandy (63) — Kaleb Hubbard 20, Carson 4, Robinson 4, Roeder 12, Gorski 14, Brewster 7, Murphy 2, Classen, Black. Clackamas (77) — Jailen Hammer 22, Mahler 7, Gavrilovich 5, Aspidov 9, Lewis 12, Erickson 12, Martinov 4, Dorn 6.? This story is slated for our Jan. 9, print edition. 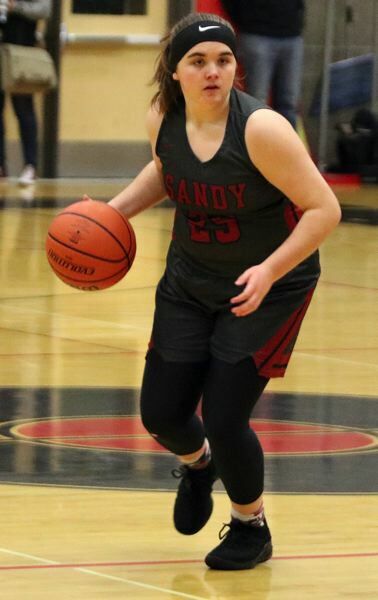 The Sandy girls team struggled to score in a 68-23 loss to a Clackamas squad that reached the 6A title game last season. The win marked the first of the season for the Cavaliers, who have played an elite preseason schedule. Clackamas' Bella Garcia and Ava Peterson scored 11 points each for the Cavaliers. Sandy's Isabella Cabrera knocked down four 3-pointers to lead all scorers with 12 points for the Pioneers. Sandy (23) — Isabella Cabrera 12, Kansala 2, Dwyre 1, Thomas 1, Turin 4, Maul 2, Adams 1, McNutt, Dukart, McCrea, Dobson. Clackamas (68) — Bella Garcia 11, Ava Peterson 11, Mongelli 9, Morris 8, Filler 6, Byzewski 2, Bui 3, Hayes 5, Wetzell 6, S. Benedict 6, P. Benedict 1, Tacheny.